Each year-end I look back and reflect. I look at all areas of my life: family, professional, personal, spiritual, physical, financial. Across all of the major areas of my life, this has been a pivotal year of conceptual progress for me. I developed great clarity on my personal mission. And three ideas that began to gel for me in 2017 continued to gather strength. Thinking about 2018, it is fair to say that this mission and corresponding three ideas have revolutionized how I approach almost all of my interactions. My mission: To spread personal and collective agency. This is true in my professional life (where I explore ways that people can develop their own sense of democratic power) but also across my personal life — where I see my role as creating the conditions in which others can see the power and ability they already have. 1. I increasingly see propagation as the key means by which personal agency spreads. This recognition must be passed on from person to person to person. Through direct contact. I am convinced that as an individual my highest and best use is in fostering this spread. More and more, I am trying to organize all of my work with attention to how it might later propagate – not just from me to someone else, but from them to yet another. This is a kind of intentional “viral” strategy. 2. I have come increasingly to place learning at the center of all of my interactions. This is the central consequence of the above point. All progress, whether personal or collective, starts with a mindset change. That means that my task is not just to convey “knowledge” but a way of thinking. Agency must be learned, it cannot be taught. I try to interact in ways that encourages others to discover for themselves. 3. More and more I try to act through attraction. If propagation is the means by which personal agency spreads, and if learning is fundamental to that, then the nature of my interactions changes. When interacting with people, my task is to invite and interest them. The future may always bring more change and upheaval, for me and for others, so I hesitate to say this is all set in stone. But looking back it is remarkable to me how powerful these ideas have been in my inner life over the past twelve months. I am looking forward to seeing how they further take root in 2019. I’m in the middle of doing one of my favorite activities, something I’ve been involved in since the late 1990’s. It’s the Candidate Training Program, run by the Sorensen Institute for Political Leadership at the University of Virginia. I was a part of the design team for this program and have been involved in different ways every since. It’s a multipartisan group (D, R, I) of people who are running for their first political office. Over the course of four days, some of the top political consultants in Virginia share the nuts and bolts of running campaigns from the standpoint of planning, direct mail, fundraising, media relations, crisis management, and more. It’s top-drawer advice and is very effective: roughly a third of alumni have gone on to win races, an astronomical statistic considering that most first time candidates lose. Here’s what makes the program different from other candidate training programs, though: It is built around ethical decision making. The design of the program is meant to elicit thoughtful reflection by the candidates on what they feel their relationship with the public ought to be. We open with an in-depth discussion of ethical decision-making principles, and then check in repeatedly throughout the weekend to unpack what the experts are saying, relating it to the kinds of relationships the candidates are trying to foster. “Resistance” — things I’ve noticed candidates just don’t want to do . . . but must. “Oh, D.E.A.R.” — Tips on campaign crisis management from a real pro. “Free Advice For Candidates” — Just a compendium of tips I’ve heard the experts tell first-time candidates over the years. “On The Lam” — A scenario for discussion that I developed and distribute, based loosely on true events. “All The News That Fits” — Another ethics scenario, again based on true events. This struck me as odd. Usually when landing, pilots tell us the weather beginning with wind. Which rarely seems to me to be very helpful. I’d be willing to bet that most passengers want to know what the temperature is, and whether it is raining. They’re not interested in visibility, except insofar as it lets them know whether it’s raining. Nor are they particular interested in windspeed, except insofar as it impacts their comfort. Yet that is what pilots begin with in their recap of the weather. Because, I believe, that this is what matters to people who fly for a living. They want to know about the winds, and about how far they can see. Temperature and rain? Less important. It’s a lesson I often think about when I have to explain something to another person, or deliver a message. Often, the way I want to package the message is not the way I should package it in order for it to be best heard. This is an important discipline. It is hard to get it right, and I’m always trying to improve. Often, when looking back at earlier communication attempts, it can be disconcerting how far off the mark I was! Now is not the time, but sometime soon, while the searing memories are still fresh, we must have a candid conversation about how we all will live in the new world climate change is bringing to us. After a disaster, there is a defiant urge to remake what was lost, brick for brick and beam for beam. But the real challenge before us will be not to remake what was, but to make something different. As our case is new, so we must think anew and act anew. I think he’s right . . . and I believe there is a growing consensus that it is time to have a national (or global) conversation about climate change and how to live with it. This conversation would not simply be an argument over what causes it or whether it is occurring. Neither would it be simply about how to stop, or slow it. It would be about what we should do — how should we live, how can we adapt, how can we mitigate? This is not a technical conversation, but a political (small p) conversation. That is, it is rooted in what we hold valuable. We have mistaken the problem as something that experts can handle, and because all the answers really cause us to face tensions between things held valuable, we slide into partisan rancor. It’s time to hold a conversation on that level, rooted in our concerns and aspirations. There is a very interesting piece by Andrew J. Hoffman in the latest Stanford Social Innovation Review on this topic — sorry to say, it may be behind a paywall. I write a monthly column published at Ethics Newsline, the flagship publication for the Institute for Global Ethics and one which I helped develop when I worked at that organization. This month’s column is about the “ethics fatigue” that has grown up around today’s young people, as they are constantly bombarded with aspirational messages and lists of important values and virtues. I recently had the good fortune to lead a session on leadership and ethics for a group of high school students. It went well — all except for one part, which fell sort of flat. As I reflected on the ups and downs of the talk, I realized that I had been having the same experience with high schoolers for some time. I’ve been giving addresses on ethics and leadership in public life for many years and in front of many audiences. These events almost always go well and generate insights in the attendees. I liberally mix my experience with the Institute for Global Ethics, my experience in civic engagement, and my experience in politics to make the basic point that, in public life, we ought to root our decision-making in shared values rather than solely in policy or law. A part of these sessions often includes an exercise in which people identify and discuss what their shared, core values might be. Later in my address, I typically use this as a foundation for other points about how to analyze situations and make decisions. It is this “shared values” portion that fell flat with my high school audience — as it has been for some time. Why? Students these days continually are bombarded with messages throughout school and extracurricular activities that remind them of what their “core values” ought to be. There are posters in the hallways with acronyms designed to generate pep and morals all at once. There are T-shirts, stickers, decals, pencils, and more — all boasting aspirational lists of values and virtues to be memorized, abided by, and spread the message. What’s more, many students also have been subjected to meetings, classes, lectures, and rallies designed to underscore these values. They’ve broken into small groups, shared their feelings, written on white boards, and addressed postcards to themselves as reminders, all in workshops designed with the same attention to psychology that an adult-education specialist might use when designing a high-stakes board retreat. The end result increasingly appears to be cynicism and fatigue. As many friends know, I have a monthly column published at Ethics Newsline, the flagship publication for the Institute for Global Ethics and one which I helped develop when I worked at that organization. This month’s column is about the lessons organizational leaders should take from the recent University of Virginia contretemps. Odd, I thought to myself. She’s new on the job. This sounds like she was fired. Odd indeed. The announcement email, which had been sent under the name of Helen Dragas, Rector of the Board of Visitors (akin to board chair), turned out to be just the opening act of an intense drama that played out over the next 16 days. This drama has forever changed how the university of Virginia will do its business. Beyond that, however, it also perfectly illustrates a new set of institutional ethics that leaders must deal with. I’ve been thinking lately about how our attitudes shift over time, especially when faced with new learning or practices. Many people are familiar with the “attitude curve,” which describes people’s response to change. It’s a U shape — people have to go through a low point before they accept change. This is a familiar idea in leadership studies (see, for instance, The Art of Leadership for an example). I have been thinking about attitude curves in a slightly different context, however. Specifically, learning new practices. This can be a new job (learning new functions and norms), a new skill (learning how to do something), or even a new place (learning a new community). At B, you’ve been thinking about making this change, and have just begun. You are elated. At C, you’ve been learning your new skill for a little bit, and the bloom is off the rose slightly. The elation has passed. At D, you’re in the doldrums. This isn’t what you wanted, you don’t like how it’s going, you question whether you even want to continue. People bail out here. But then . . .
At E, you’ve turned a corner. Turns out D was a bottom of sorts — here, you begin to acquire your new skill or knowledge with increasing ease. Your attitude improves and you begin to see that, even if you have a ways to go before you are an expert, you might be able to make it. At F, you feel as if you are well on your way. You know the worst is behind you, and you are glad you pushed through. But then . . .
At H, your new skill or culture or whatever is fully integrated. It’s a part if you, and you’re basically back to your attitude back before you got on the curve. The length of the curve is different for different people and for different circumstances. As is the depth of the low spots. Taking guitar lessons, for instance, brings less intense low spots, and they come a bit quicker than major life-change pursuits. 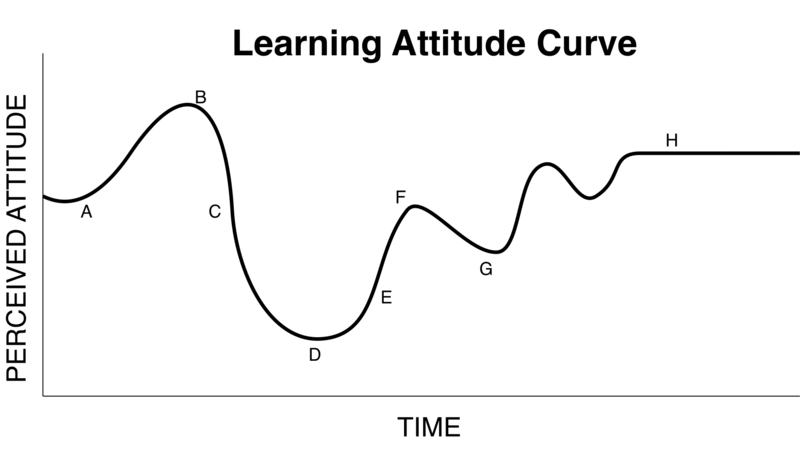 When I first learned about the “attitude curve,” I thought it was an incredibly negative way of looking at things. But I have come to see that it is actually quite hopeful — at least it has given me hope, on many occasions. It also helps me in dealing with others. With a new job, for example, it is helpful to know that “D” often comes about 6 months in. If I am interacting with someone who is new on their job, I can understand more about how and why they are behaving. In recent months, I’ve been going through a learning process and have been riding this curve. Recently, I woke up and realized I had passed through “D” and was on my upswing. I know there will be ups and downs to come, but there’s a spring in my step and a song in my heart. Knowing that there is a curve is useful, because it reminds me that whatever I am feeling about where I am at . . . it is temporary. It will change. That gives me the motivation to push through low spots and not bail out.